Highlights of the year&#8217;s major events in the North American auto industry. • The automotive year starts out with a bang in January with a jam-packed media schedule at the North American International Auto Show. A roster of 22 press conferences between 6:30 a.m. and 8 p.m. signals auto makers have a lot to say. That’s a positive sign for an industry that has taken its lumps. Among the key unveilings at NAIAS is the ’12 Chevrolet Sonic. The new subcompact replaces the Korean-built Aveo and will be assembled at GM’s Orion Twp., MI, plant, where the auto maker invested some $545 million. A new local contract with the United Auto Workers union makes it possible. • The Chevy Volt extended-range electric vehicle and Ford Explorer cross/utility vehicle win the North American Car of the Year and North American Truck of the Year Awards. Considered all but dead two years before, Chrysler has two finalists in the Truck of the Year competition, the Jeep Grand Cherokee and Dodge Durango SUVs. • The mood is upbeat early in the year. “We are in a growth industry. In fact, it looks like double-digit growth in 2011. That should bring a smile to your face,” Ellen Hughes-Cromwick, chief economist-Ford, tells the Society of Automotive Analysts 23rd Annual Automotive Outlook Conference. 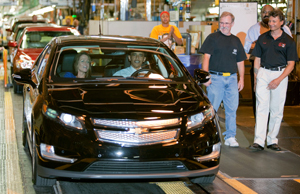 Many analysts predict U.S. light-vehicle sales in excess of 13 million units for 2011. • A final tally reveals that 11.6 million light-vehicles were sold in 2010, an 11.1% increase over 2009 but still the second-worst year since 1982. • On March 11, the worst earthquake in more than a century devastates Japan. Subsequent catastrophes at nuclear power-generating facilities cripple Japan’s power grid and hinder vehicle and parts exports and production in North America for most of the year. • In April executives from major U.S., European and Asian auto makers speaking at the SAE World Congress agree the internal-combustion engine will be the dominant powertrain for the next 15 years or more. But stringent new rules for fuel economy and carbon-dioxide emissions looming on the horizon after 2016 have the world’s auto makers choosing divergent paths for meeting those standards in the U.S., especially in the area of alternative fuels. • In May, the National Highway Traffic Safety Admin. announces highway deaths fell to 32,788 in 2010, the smallest number of traffic fatalities since 1949. • Honda says it will invest $800 million in a new vehicle and engine plant in Mexico with capacity to produce 200,000 units annually beginning in 2014.The Japanese auto maker does not reveal the models to be built at the new facility, saying only that it will produce “fuel-efficient subcompact vehicles.” The plant will be located in a suburb of Celaya, Guanajuato, about 210 miles (340 km) east of Honda’s existing operations in El Salto, Jalisco. • Diesel technology specialist Robert Bosch says diesel share will more than triple to 10% by 2015 in the U.S. There are 20 light-vehicle nameplates available in the U.S. with modern diesel engines in 2011, but that number will double in less than three years as auto makers position their portfolios to meet the federally mandated fleet average of 35.5 mpg (6.6 L/100 km) by 2016, says Peter Marks, chairman, president and CEO of Robert Bosch LLC. • In late July, the Obama Admin. proposes a new corporate average fuel economy rule of 54.5 mpg (4.3 L/100 km) by 2025. While auto executives and environmental groups unite to support the target, engineers tasked with meeting the bogey are skeptical, as are auto dealers who must sell vehicles to fickle consumers. • Volkswagen de Mexico’s plant in Puebla builds more light vehicles through the first six months than any North American assembly site, according to data compiled by WardsAuto. The new-for-’11 Jetta is credited. Sales ballooned 66% to 91,751 units from 55,258 the previous year. • The United Auto Workers union wins some $2.5 billion of investment in U.S. plants, work originally planned for Mexico, as part of a new agreement with General Motors. The investments, which include restarting an idled Spring Hill, TN, assembly plant and confirms closing a facility in Shreveport, LA, adds or retains some 6,400 union jobs at GM. • In September, BMW Mfg. Co. in Spartanburg, SC, is recognized as the largest vehicle exporter from the U.S. to non-North American Free Trade Agreement markets. • Volkswagen of America delivers its first customer-purchased ’12 Passat built specifically for the North American market at its new $1 billion plant in Chattanooga, TN. • In October, just as Japanese auto makers are getting their production back on track, massive floods in Thailand swamp supplier plants feeding subassemblies to several Japanese auto makers in North America, most notably Honda and Toyota. Honda’s own plant is flooded by 5-ft. (1.5 m) of water. • North American fourth-quarter vehicle output takes a hit, with 204,600 units wiped from the slate. That tally includes a sharp October underbuild, estimated at 63,800 vehicles, much of it due to parts shortages related to the floods in Thailand. • After taking a beating in quality ratings over its trailblazing but complicated MyFord Touch telematics system, Ford announces it is making changes to simplify the system. “We’ve gotten feedback from customers and listened to them, and I think we’ve incorporated their thoughts,” says Mark Fields, Ford president-The Americas. • Apparently unfazed by murmurs of a double-dip recession, new-vehicle buyers beat a path to Chrysler showrooms in October as the auto maker records a 31.9% sales jump, compared with like-2010. Excluding performances influenced by Chrysler’s 2009 bankruptcy and the August 2009 government-backed Cash-for-Clunkers buyer-stimulus program, it was the auto maker’s best year-over-year gain since a 33.2% hike in April 1996. • The 2-tier wage structure that allows Detroit auto makers to pay entry-level hourly employees substantially less than veteran line workers must go, Chrysler CEO Sergio Marchionne says. Workers ratify a new 4-year deal in October crafted by Chrysler and the UAW that clears the way for the auto maker to hire an unlimited number of tier-2 workers. But Marchionne says the two sides will work between now and the next round of negotiations in 2015 to abolish the two wage rates. • John Mendel, executive vice president-American Honda, says in November the auto maker is considering more North American production, in part because of the strong yen. Hyundai’s U.S. CEO, John Krafcik, says the Korean auto maker also is considering another U.S. plant, to keep up with consumer demand. • U.S. auto makers report their second consecutive monthly SAAR in excess of 13 million units, while European brands take 10% of the market, their largest collective share ever. The October seasonally adjusted annual rate of sales is 13.2 million units, slightly better than September’s 13.05 million rate. Encouraging news, but 2011 sales are headed for a total of about 12.5 million deliveries, as much as a million units short of what the industry was hoping for at the beginning of the year. • As the year nears its close, most analysts forecast 2012 U.S. sales of 13.2 million to 13.6 million units, not far from what was originally predicted for 2011.